Located at Kedaton Hotel, Bandung, on 22 April 2013 took place symposium organized by Plasmin in collaboration with PINTI (Chinese Indonesian Association). 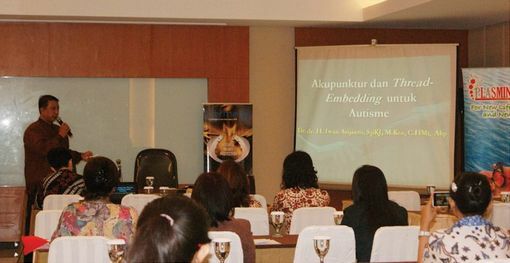 The symposium was attended by the Association of West Java acupuncturist is to discuss two interesting topics, namely “Cervical Tumor Cases with Stroke Complications” presented by dr. Hani Surjati and “Acupuncture & Threat Embedding for Autism” presented by Dr. dr. H. Iwan Arijanto, SpKJ, Mkes, as well as some Plasmin research presented by Dr. Lidia S. On this occasion, Natural products of Landson – PT Pertiwi Agung got positive response and welcome from the acupuncturist who attended, especially Plasmin as trombilisis and fibrinolysis products, Astria as an antioxidant, and Cormega which can help maintain a healthy, control the fat content in blood, and the prevention of cardiovascular disease. Hopefully, through this symposium, the acupuncturist can know more about Landson Natural products even better.